"Sky Sanctuary" redirects here. For the Sonic Generations level, see Sky Sanctuary (Sonic Generations). 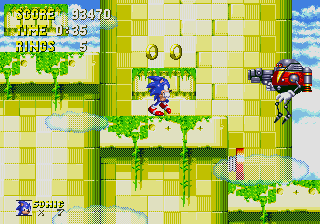 Sky Sanctuary Zone is the sixth level of Sonic & Knuckles (the twelfth of Sonic 3 & Knuckles). It is the second-to-last zone for Sonic and Tails, containing three bosses, and the last for Knuckles, who has two to fight against. Sonic and Tails' level (technically Act 1) has a very complex design that goes upwards and contains several Eggrobos, big spinning platforms and clouds on which you can bounce. Sonic and Tails enter from a teleporter found deep in the Hidden Palace. On their way up the Sanctuary, they have to face Mecha Sonic, who's riding Eggman's Eggmobile and using the Doctor's old tricks to stop them. They eventually face the Mecha Sonic istelf at the end of the level, and after defeating the robotic hedgehog (though not destroying him) the Sky Sanctuary will begin to fall apart. They have no choice but escape as fast as possible from there, and they finally jump into the Death Egg. As for Knuckles' level (technically Act 2), it seems to be the only platform left after the destruction of the flying temple; it's short, straight and it has no enemies or gimmicks. Knuckles enters from a different teleporter, also from the Hidden Palace, and as soon as he gets to the Sanctuary he is grabbed by the Eggmobile (this time driven by the lone Eggrobo faced throughout the echidna's story) and taken to the boss, Mecha Sonic, who was not completely destroyed in Tails/Sonic's story. Sky Sanctuary is apparently destroyed at the end of Knuckles' playthrough, with the explosion of Mecha Sonic consuming the floating ruins entirely. The first boss is a clone of Green Hill Zone's famous boss, piloted by Mecha Sonic. The second boss is a clone of Metropolis Zone's boss, also piloted by Mecha Sonic. It doesn't stay out of reach this time, though, making it easier to hit and beat if you know what you're doing. The third boss is Mecha Sonic himself. Making a comeback since Sonic 2 (16-bit), this battle can be a lot easier this time, as it still takes eight hits to defeat him but you now count with rings you grabbed throughout the whole level and any shield you got before. The first part is Mecha Sonic, and he acts just the same as he does against Sonic. Finish him off with an easy eight hits. The second part is against Super Mecha Sonic. He'll charge himself with the Master Emerald's power, then fly above you. He has 4 attacks: Dashing across the ground, hitting the ground in ball form, firing three energy balls, and shooting out fatter, darker versions of rings that hurt you upon contact. After using the energy balls, Mecha Sonic will revert to normal and have to recharge. He'll also temporally have to charge up after shooting the fatter rings, but he will come down without landing and get back to his normal form for less than three seconds, then take again his super form. Every time he goes from gold to dark blue again is your chance to strike. As before, eight hits will finish him off. Eggrobo - A robot with a laser pistol that resembles Dr. Eggman. Mecha Sonic - A robotic version of Sonic. When playing as Sonic/Tails in the act 1 stage, after Knuckles has jumped across onto the button that extends the bridge, there he will remain tired and gasping for breath. However, if the player positions Sonic/Tails on the right side of Knuckles, inbetween the BG and FG ruin blocks, and presses down on the D-Pad, Knuckles will begin pointing right in the form of "advising" the player to continue. Via Level Select, you can enter one of the character's Sky Sanctuary levels with the character that's not able to get there in normal gameplay: you can enter to Sonic's level with Knuckles (here are shown the palette differences between the playable Knuckles and the one that appears throughout Sonic's story) and then normally head up to the Death Egg, or you can get into Knuckles level with Sonic and/or Tails and almost normally end the game. If it is instead finished with Tails, Knuckles will have two tails during the cutscene. A reimagined Sky Sanctuary appears in Sonic Generations, representing Sonic 3 & Knuckles in the Classic Era of the game. Bouncy clouds, Eggrobos, teleporting beams and temples above the skies return with breathtaking views and gimmicks from other past stages, such as the floating spinning-tops from Marble Garden Zone. Angel Island's overhead sanctuaries are the setting for one of the racing circuits in Sonic & All-Stars Racing Transformed, known as Sanctuary Falls. The course features both an aerial segment based on passing between temple columns and a land segment set in the sanctuary's interior. Sky Sanctuary is the setting for the final 11 stages in the game's story, ranging from 37 (Sweet Home) to 48 (The Last Refuge). Sky Sanctuary appears in this game as one of 3 stage themes, with the same aesthetics of previous versions. During the Christmas event, Sky Sanctuary acquires a night-time style similar to that seen in Sonic Generations. Sky Sanctuary is apparently supposed to hover at relatively the same height of Angel Island. 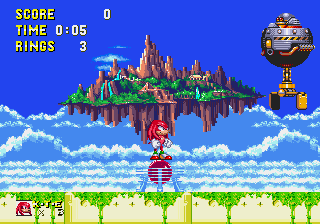 As revealed by the good ending for Knuckles, Angel Island floats high above where Sky Sanctuary was. It is possible that the reason for this is Eggman's crash landing on Angel Island somehow affected Sky Sanctuary's height as well. This would make sense as in Knuckles' final boss features the Master Emerald on Sky Sanctuary's remains but Angel Island is still (barely) floating. This could mean that through Angel Island, the Master Emerald originally kept both Angel Island and Sky Sanctuary at a stable and similar height. In Mario & Sonic at the Olympic Winter Games, a remix of the musical theme of this zone is played in the Dream Gliding event.